Google translate: who needs it anyway? Well a chàirdean, dè an saoghal a th'agaibh? Tha Gilleasbuig còir air a dhòigh ghlan gu bheil an t-earrach air tighinn agus gu bheil saoghal na Gàidhlig oifigeil a' cur thairis le brathan-naidheachd dhen a h-uile seòrsa. Mar a shaoileadh sibh, tha ar laochan às dèidh feadhainn dhe na h-eisimpleirean as outstanding a ghlaic a shùil-san a thoirt còmhla dhuibh anns a' bhlog aige fhèin, blog a bhuinnig iomadach duais. 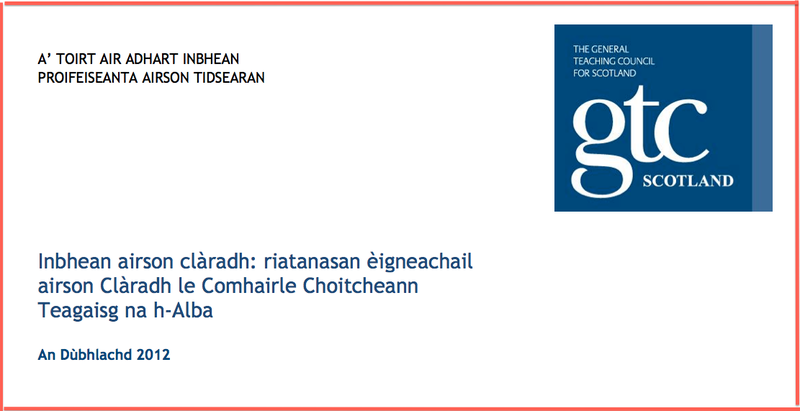 The search for the most unreadable Gaelic document is over! "Tha An Inbhe airson Clàradh fo Chùmhnant (SPR) agus An Inbhe airson Làn Chlàradh (SFR) mar phàirt den phasgan de dh’Inbhean Proifeiseanta GTC Alba a tha cuideachd a’ gabhail a-steach An Inbhe airson Ionnsachadh Phroifeiseanta Fad-dhreuchd agus Na h-Inbhean airson Ceannardas agus Rianachd. Tha na h-inbhean sin air an daingneachadh leis na cuspairean luachan, seasmhachd agus ceannardas. Tha Luachan Proifeiseanta aig cridhe nan Inbhean airson Clàradh. 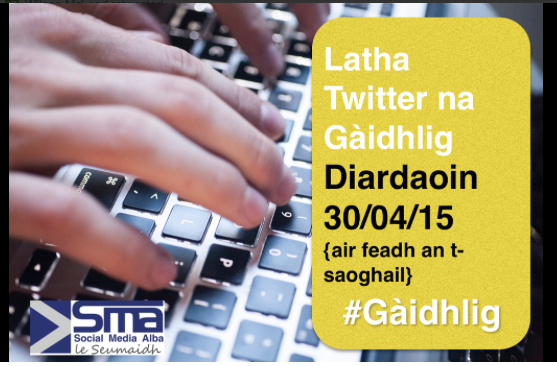 Tha iad mar phàirt deatamach de, agus air an taisbeanadh tro, ar càirdeasan agus ar cleachdaidhean proifeiseanta. "Is e dealas làn-sgoile a tha ann an “Ionnsachadh airson Seasmhachd” a tha a’ cuideachadh na sgoile agus a coimhearsnachd san fharsaingeachd a bhith a’ leasachadh an eòlais, sgilean, beachdan, luachan agus cleachdaidhean a dh’fheumar gus a thighinn gu co-dhùnaidhean a tha a rèir seasmhachd san àm ri teachd ann an saoghal a tha ceart agus cothromach. Tha ionnsachadh airson seasmhachd air a bhith air fhighe a-steach sna h-Inbhean airson Clàradh gus taic a thoirt do thidsearan ann a bhith a’ gabhail thuca fhèin ..." OK, OK! Sin gu leòr a cheana! - Gilleasbuig. A bheil seo na h-aithisg ùghdarrasail dha-rìribh a tha cur ris a' Ghàidhlig agus ri beatha is foghlam muinntir na h-Alba, mar a shaoileadh neach bhon a' bhuidheann iomraiteach seo? Carson a tha am mathan sin a' dèanamh air a' choille na dheann? 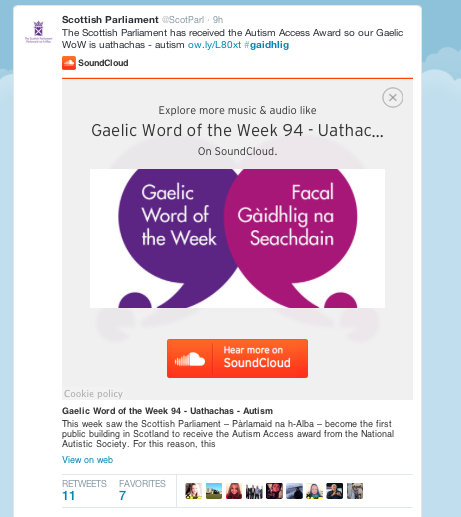 Tha fios le cinnt agam gum bi muinntir na coimhearsnachd autistic air an dòigh ghlan leis an fhacal seo, oir is toil leotha facail glè choltach ri "fuath" is "uabhas" gan sparradh orra bhon taobh a-muigh le cuangocrat, gun cho-chomhairleachadh sam bith. "Le taic iomchaidh, faodaidh òigridh agus inbhich le diosleacsia a’ cheart uimhir a choileanadh ri neach sam bith. Tha piseach ri bhuinnig do dhaoine a tha ag ionnsachadh fo bhuaidh diosleacsia le bhith ga aithneachadh tràth, a’ faighinn cobhair fhreagarrach agus teagasg le amasan èifeachdach, a’ fuasgladh cothroman ..." You get the gist. 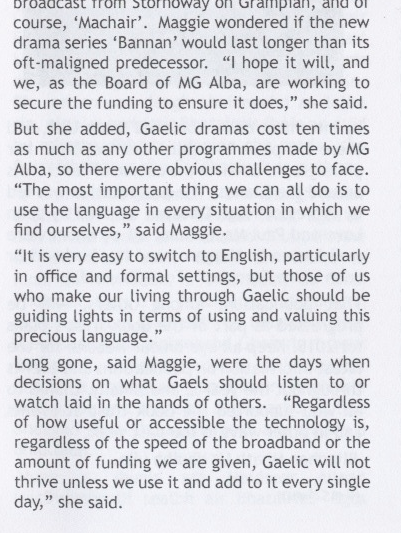 An t-seachdain-sa, fàgaidh Gilleasbuig sibh ann an cuideachd Magaidh Choineagan, cathraiche air "Gaelic" broadcaster MG Alba, is i gabhail òraid-chuimhneachaidh Aonghais "Ease" MhicLeòid san Dàmhair seo chaidh. Chan chan e 'n còrr. Ag iarraidh tuilleadh fiosrachaidh air mar a chaidh do dh'fheallsanachd Magaidh san t-sianal TV aice, BBC Alba? Feuch thusa http://www.gaidhlig.tv.